SALEM, OR — Today, a press release from Anomali Labs stated that Oregon's voter registration list is one of 19 states’ voter lists allegedly being sold on the internet. 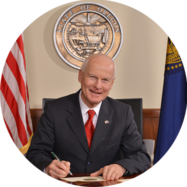 Secretary of State Dennis Richardson took immediate action in response to this claim. "My office has requested assistance on this matter from both the FBI and the Oregon Attorney General's internet crimes unit," said Secretary of State Dennis Richardson. "Oregonians need to know that the release and use of publicly available voter registration information has no impact on the security and validity of Oregon’s elections."